Arnold Schwarzenegger's Pumping Iron, own this classic bodybuilding movie on DVD! This movie is a must have for any bodybuilding fan! Arnold Schwarzenegger The Comeback, see Arnold going for an unprecedented 7th Mr. Olympia title after taking five years off to pursue his movie career. Cybergenics Workout Video, The full Cybergenics 60 day Total Bodybuilding System training routine. Mike Mentzer Workout DVD, Build the physique you've always wanted with Heavy Duty Training! Mike Mentzer's Underground Seminar DVD, This DVD is the only recording of Mike Mentzer's Seminar. Two full hours of Mike discussing exercise fundamentals, their relationships, and stories of past clients. Hear Mike discuss exercise theory, applying that theory to bodybuilding, answering questions from the audience. He explains the mistakes made by nearly everyone who picks up a weight and much more. Very entertaining, educational and a MUST for any Mike Mentzer fan. Psycho-Burst Training System, for a mind-blowing pump, dramatic increase in muscle, a noticeable depletion of Body Fat, and an increase in strength and stamina levels. Bodybuilding For The Genetically Average Joe, a step-by-step guide bodybuilding training and diet guide for hard gainers and people with average genetics, that teaches you the secrets, tips, and techniques you need to know to build a muscular physique...FAST! Build Muscle DVD, Would you like to learn exactly how to blast through training plateaus and double your muscle gains? No Pain No Gain Bodybuilding DVD , the first bodybuilding feature film since "Pumping Iron." However, it is not a documentary, but rather a powerful, inspirational, dramatic movie -- the "Rocky" of bodybuilding. 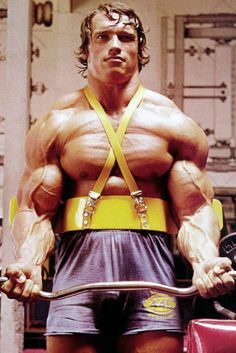 Pumping Iron Film Review the best of all the Bodybuilding Documentaries staring: Arnold Schwarzenegger, Lou Ferrigno, Matty Ferrigno, Franco Columbu, Ed Corney, Mike Katz, Ken Waller, Serge Nubret, Frank Zane, Robbie Robinson, Danny Padilla, Roger Callard, Paul Grant, Bill Grant. Announcing the Pumping Iron 25th Anniversary Special Edition see Pumping Iron Clips, Arnold's Pumping Iron Workout and Pumping Iron Pictures listen to the Pumping Iron Music MP3, read Pumping Iron Song Lyrics and Pumping Iron Quotes, buy a Pumping Iron Poster, get your own Arnold Pumping Iron Shirt or Buy Pumping Iron. Total Rebuild features Arnold Schwarzenegger vs Mike Mentzer in The Controversial 1980 Mr. Olympia.